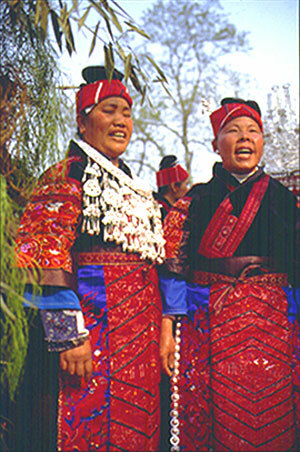 ShiDong is a remote, typical and very well kept traditional Miao area in southeast of GuiZhou province. 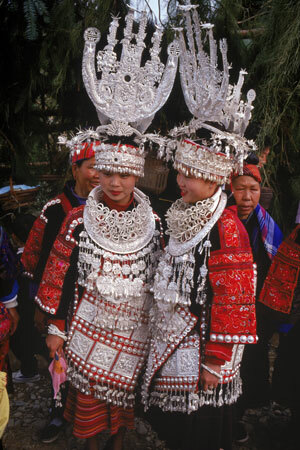 On special days or festivals Miao people dress up even more decoratively. Silver ornaments and jewelries are worn to the best. Years ago in GuiZhou, there was an old saying: "Land with no 3 feet flat, weather with no 3 days clear, people with no 3 ounces silver", describing this land-locked hilly province's poor and harsh living conditions. But I see nowadays, people certainly have more than "3 ounces silver", many women were wearing more than 20 or 30 pounds of silver at once!